The South West region of Bovis Homes has been busy fundraising for Macmillan Cancer Support, raising a fantastic £1,800. That's enough to fund more than 10 Macmillan grants for cancer patients to heat their homes. Bovis Homes have now set their sights on raising enough for another 10 grants this year. Bridget Hill, local Fundraising Manager for Macmillan Cancer Support said, "We are extremely grateful to Bovis Homes' employees in the South West. 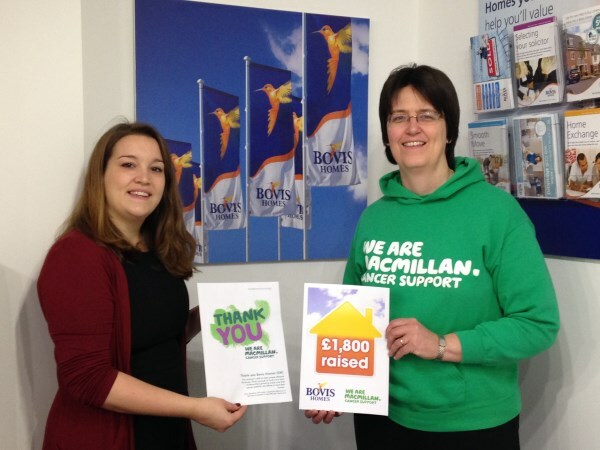 In 2014, 1,352 people in the area covered by Bovis Homes' South West Region received a Macmillan Grant. Of those, 466 were to help people heat their homes. "Cancer treatments, reduced activity and simply being at home more due to absence from work can all cause home heating costs to soar. This can have a huge financial impact on cancer patients and their families at a time when often their household income has also been reduced." Kate Brewer, Marketing Manager for Bovis Homes' South West region said: "Bovis Homes are proud to be supporting such a worthwhile cause and colleagues have been only too willing to donate time and money for MacMillan and the work they do. Many people have some connection with cancer, sadly, and by supporting Macmillan we are helping to support colleagues, friends and family through hard times. "It's amazing how quickly the pounds add up. We've had bake sales, dress-down days and a charity raffle at our annual dinner dance, where prizes were kindly donated by our suppliers. We are currently planning more events this year and we're looking to double the figure we've so far handed over." MacMillan grants are playing a crucial role in supporting cancer patients. Bridget explained: "As well as heating costs, other typical expenses Macmillan grants help with include clothing, fares to and from hospital, washing machines and other household items, but grants can also be provided for items that help individuals with cancer to continue with activities they enjoy. For example, we gave a grant to a man with cancer of the larynx to help pay for a special swimming device, so that he could still enjoy swimming after his operation." Anyone wanting to find out more about Macmillan grants should ring the Macmillan Cancer Support helpline on 0808 808 0000.